1. Heat. When tomatoes face temperatures that are too hot, they may drop blossoms or have difficulty setting fruit. Tomatoes for the south are heat-tolerant. Most can set fruit a higher-than-normal temperatures. 2. Blight. The south’s humidity creates fertile breeding conditions for the fungi that cause both early blight and late blight. Dry summers mean less blight. Wet or humid summers cause blight to flourish. Tomatoes for the south are resistant to blight or strong enough to keep producing through a bad case of blight. 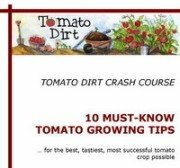 Check out these tomato varieties that do well in heat and humidity. Heirloom tomatoes and hybrids: what's the difference?